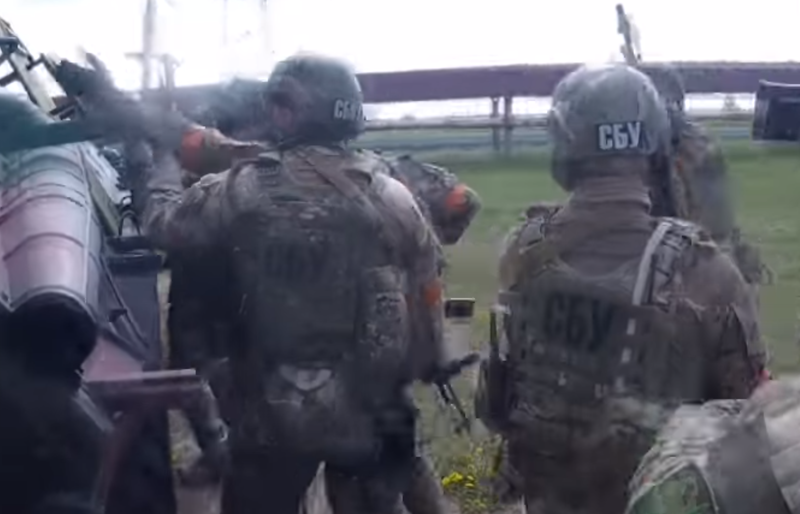 On July 23, the YouTube channel “Pavlo Pablo” posted its first and only video: a 65-second clip entitled “Disarmament” showing what appeared to be an operation of the Ukrainian Security Services (SBU) against a group of far-right militants, which ended with an SBU officer roughing up one of the men who fired at them during the operation. 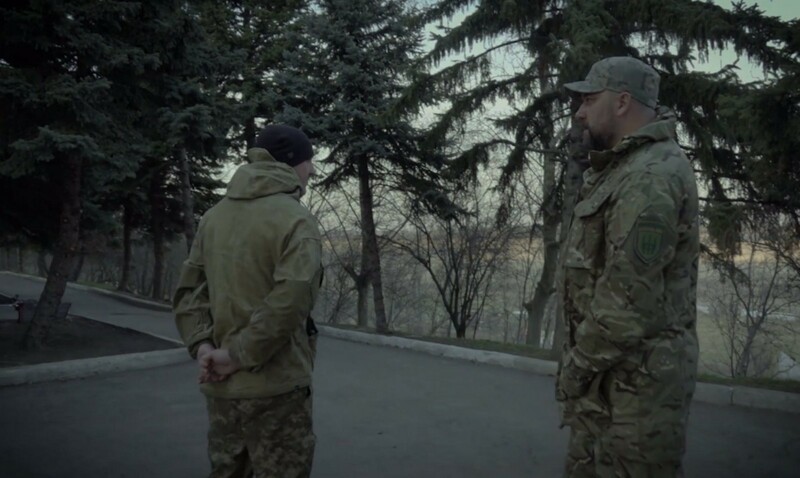 Throughout the video, the “SBU” officers tell the men in the nearby building to lay down their arms and call them “Banderites”, which is a derogatory term for Ukrainian ultra-nationalists. The action depicted in the video is plausible when compared to similar, verified actions taken by the SBU over the last year. However, one item distinguishes this video: the Ukrainian Security Services vehemently declared this video a fake. This video’s emergence coincides with recent remarks from Ukraine’s Joint Operational Headquarters (formerly known as the Anti-Terrorist Operation) commander Serhiy Nayev noting that all fighters on the frontlines should be part of the structures commanded by the Ukrainian Armed Forces or the Ukrainian Ministry of Interior Affairs. These remarks were aimed at fighters from independent volunteer groups fighting against Russian-led separatists in eastern Ukraine, specifically the Right Sector’s Volunteer Ukrainian Corps and Ukrainian Volunteer Army. After the outbreak of war in 2014, volunteer battalions, which were often organized by far-right and ultra-nationalist groups, proved vital in key battles and provided the Ukrainian government with enthusiastic fighters while the Ukrainian Armed Forces rebuilt its ranks. By 2015, most of these groups were integrated into the Ukrainian military and security forces, including the National Guard organized within the Ministry of Interior Affairs. Some of the more well-known far-right groups that have been integrated into the Ukrainian government’s security forces include the Azov Battalion members forming military unit 3057 of the National Guard based in Mariupol, and Right Sector members joining Ukraine’s 54th Motorized Infantry Brigade. However, tensions between the Ukrainian government and its security forces and these far-right groups have steadily risen. In particular, in July 2015, a shootout between Right Sector members and Ukrainian security forces led to at least three deaths in western Ukraine. More recently, far-right activist groups — some of which have military formations that have fought in the Donbas — have taken to the streets to “patrol”, carried out pogroms on Roma camps, disrupted conferences aimed at assisting the LGBT community, and other illegal actions. In particular, there has been intense international criticism of Ukraine’s handling of these groups following a lethal attack on a Roma camp outside of L’viv, including a recent report from the New York Times. With these recent developments from the Ukrainian Joint Operational Headquarters and the far-right community, it’s easy to be skeptical of a video showing a clash between the SBU and far-right fighters near the frontline. Few details were visible in the brief video, but there a handful of clues allowed us to carry out verification. Firstly, we looked at the uniforms of the “SBU officers” carrying out the raid. On some of the uniforms, a white-on-black SBU patch is visible, though not everyone had this on their gear. One person in particular wore it on the back of his helmet, but not his back, along with yellow armbands on some of the men. As pointed out by the Military in Ukraine portal, this was an old patch designed with white-on-black “SBU” (СБУ) lettering, allegedly no longer used by the SBU, as the new one for 2018 is black-on-grey. Reviewing recent videos of SBU actions, we can assess this claim. Footage from a recent SBU operation near L’viv showed the new patches, along with similar yellow armbands seen in the video in question. 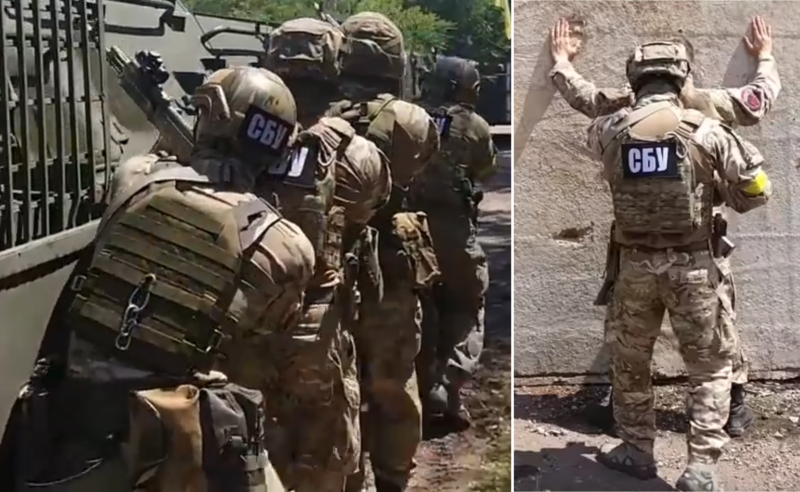 Lastly, a different video from April 2018 uploaded to the SBU’s YouTube channel showed how some body armor had the new black-on-grey design, some have the old white-on-black design, and some do not have any patches at all. Considering that videos on the SBU’ s YouTube channel shows a variety of SBU patches on their forces’ uniform, we cannot conclusively say that the new video is a fake because of their use of the older white-on-black design. Others raised questions about specific equipment and camouflage patterns on the soldiers; however, it is difficult to point out these specific aspects as definitive proof of fakery. Next, @DFRLab looked at the vehicles and flags in the video. Two armored personnel carriers (BTRs) were visible throughout the video, both of which had flags on them. However, in the beginning of the clip, the flag on the nearest BTR was not visible, but appeared moments later — it was unclear if the flag was placed on the antennae while the camera was out of frame, or if it was simply not visible from the initial angle. 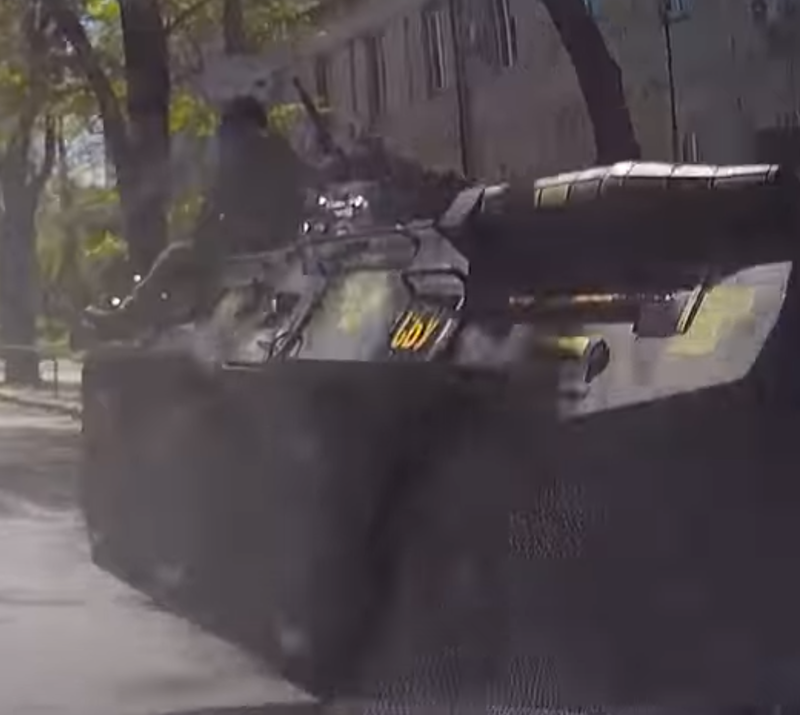 Additionally, the BTR furthest from the camera had two white stripes on it — a common feature of Ukrainian military vehicles during the initial stages of the Anti-Terrorist Operation, along with the cage armor on the first BTR. Below, the antennae and flag from the first BTR is marked with a yellow arrow, and the double white stripes on the other BTR is marked with a white box. While these BTRs seem to looked similar to the equipment used in the Ukrainian Armed Forces, they did not match that of the SBU. 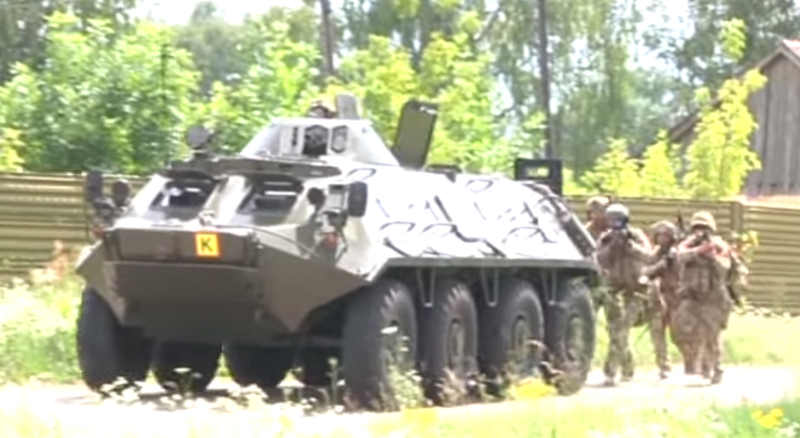 A sample of open sources showing BTRs used by the SBU did not reveal any that used the cage protection on the BTR chassis, displayed flags, or the double white line. An April 2017 video shows SBU officers on a BTR, with the “SBU” letters written in yellow paint, as it runs a red light in Mykolaiv. 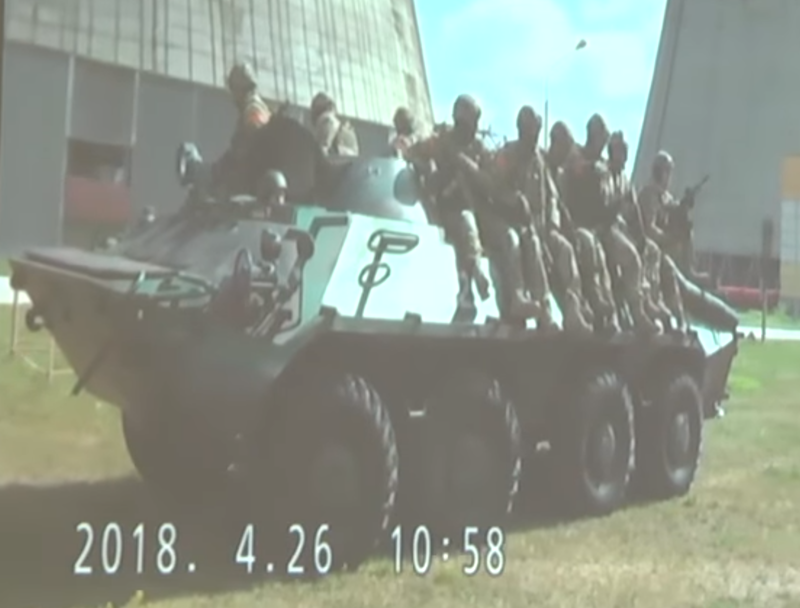 An April 2018 video showing a training exercise near Rivne where SBU officers arrived atop a BTR. 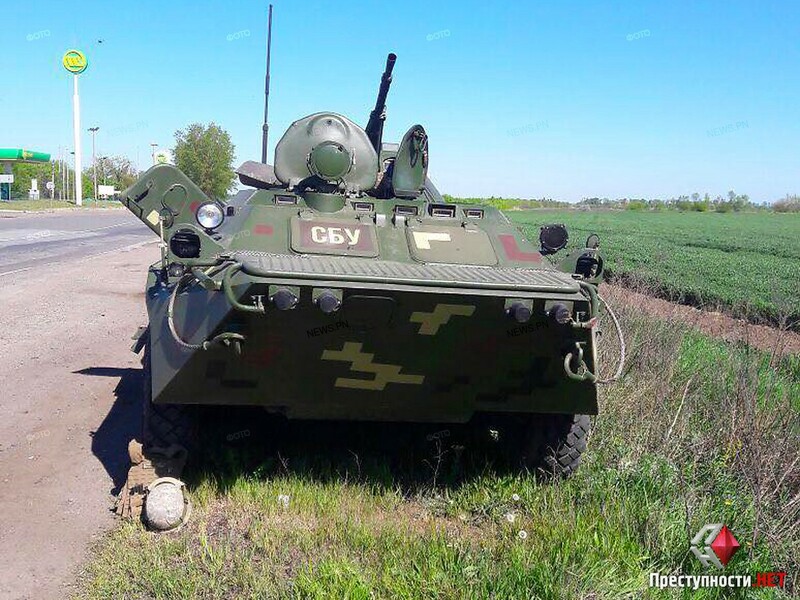 An April 2018 photograph showing an SBU BTR at a checkpoint near Mykolaiv. A November 2017 video showing a training exercise near Dnipro, with a modernized BTR stationed nearby. A July 2017 video showing a training exercise in the Volyn Oblast, with a BTR used during the training. 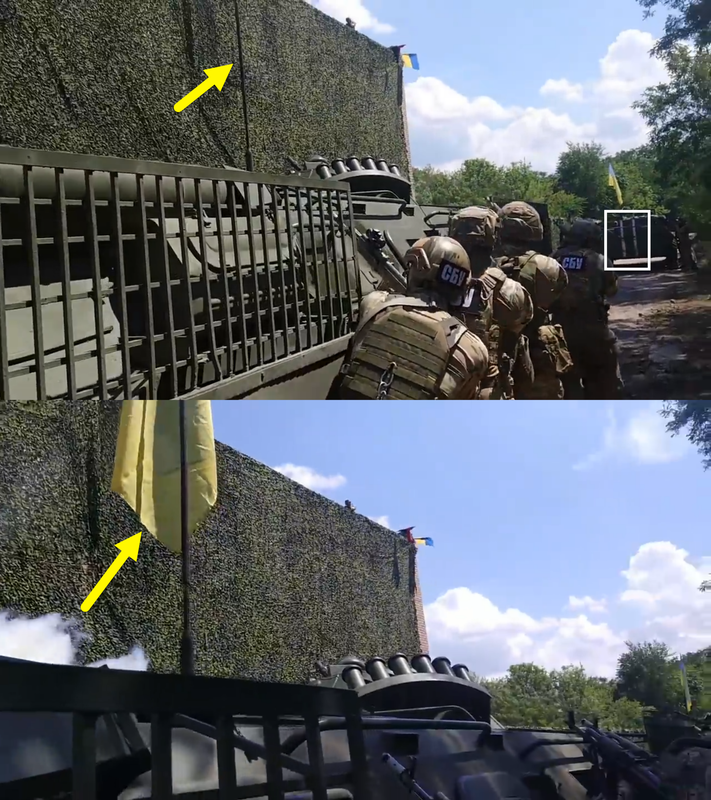 While there were many more examples of SBU BTRs being used in 2017 and 2018, this survey showed that none of them in real operations or training exercises had a double-white line, displayed flag, or cage armor, as the ones in the video in question did. These three characteristics were quite common for BTRs in the Ukrainian Armed Forces, and if someone was making a staged video showing an “SBU operation”, they may not note the difference in the equipment used by the Ukrainian military versus the security forces. The video’s uploader did not provide any information about where the operation allegedly took place, but contextual clues and reports from the opposition publication Strana.ua provided the most likely candidates: an operational base for Right Sector fighters of the Ukrainian Volunteer Corps (DUK) or the Ukrainian Volunteer Army (UDA), namely its 8th Battalion, called “Aratta”. Strana.ua, the largest Ukrainian publication advocating the veracity of the video, named a handful of times in which Ukrainian volunteer groups were disarmed by government officials in 2018. In particular, Strana said that the clip may show a sweep from June 2018 in the town of Manhush, near Mariupol, against Right Sector soldiers of DUK. Unfortunately, @DFRLab did not find any potential bases in the town of Manhush that DUK or Right Sector openly operated out of. If you find any locations that could fit the location seen in the suspicious video (see Wikimapia of the area here) or that was used by Ukrainian militants in 2018, please leave a comment to this article or tweet at us here. 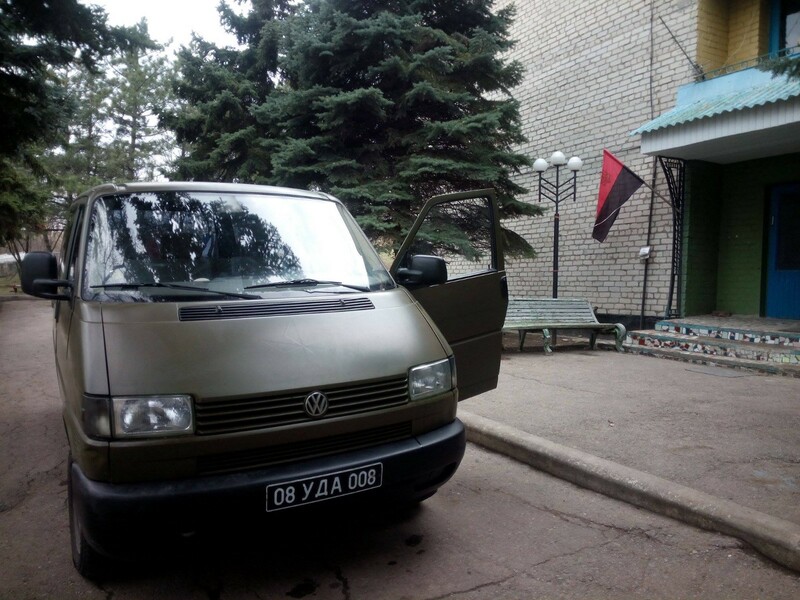 There was also a base of operations in the nearby village of Yurevka, south of Manhush and west of Mariupol, used by the “Aratta” group, part of the Ukrainian Volunteer Army (UDA) established by Right Sector founder Dmytro Yarosh. This location did not match the area seen in the suspicious video. A tall building with a common brick pattern seen throughout Ukraine (magnified below — five rows of “long” bricks for each row of “short” bricks). A high wall (a foot or two taller than the average person) that surrounds the main building. A path surrounding the building. Telephone and/or electric lines surrounding the building. 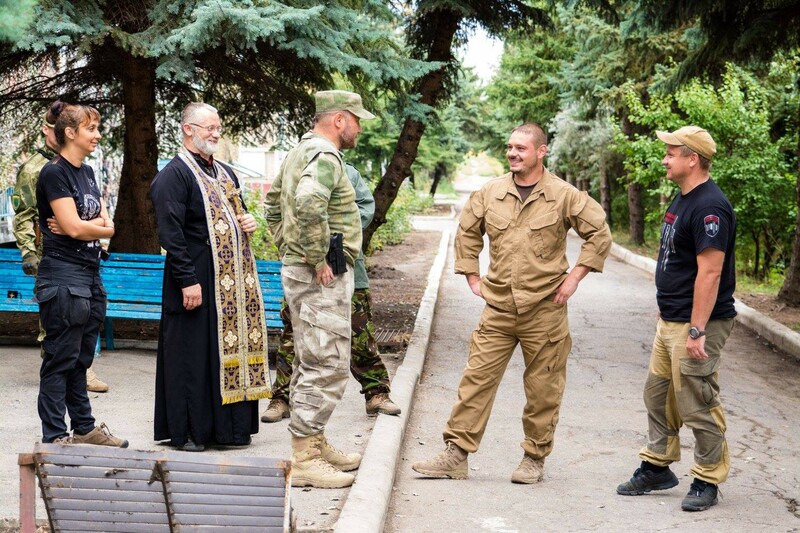 In photographs of the Aratta base in the Mariupol suburb of Yurevka, few of these details are present. There is no wall around the main building, and the paths surrounding it are paved better and with curbs. With the scant details visible in the suspicious video, it is difficult to definitely say that these bases are different; however, there are no evident details that point to a match. The Ukrainian Security Services came out strong in declaring this video a fake, and most Ukrainian media outlets and independent analysts have backed up this claim. The lone audible voice in the Ukrainian media landscape arguing that this video could have shown a real operation was Strana; however, no evidence has been presented affirming this claim outside of anonymous sources within far-right volunteer brigades. There is no single detail within the video that conclusively debunks it as a staged event. That said, there are numerous small details — the uncharacteristic flag on the BTRs, the outdated patches on the uniforms and helmets of the “SBU officers”, the unconvincing acting of the “SBU officer” and detained man at the end of the video, how the “SBU officers” yell about “Banderites”, the lack of any reliable reports of this raid happening outside of the video and anonymous sources to Strana, and so on— that mount up to a strong assertion that the video was likely staged. The most likely way to conclusively debunk this video would be either in geolocating the scene, similar to how Andrei Soshnikov at the BBC was able to debunk a series of staged photographs showing Ukrainian forces as ISIS sympathizers by geolocating them to Donetsk, or by identifying the individuals in the video, namely the man who is beat at the end. Until then, there is no reason to put trust in this suspicious video. For more in-depth analysis from our regional experts follow the Atlantic Council’s Dinu Patriciu Eurasia Center. Or subscribe to UkraineAlert.